Philadelphia Flyers goalie Brian Elliott defends the net against Pittsburgh Penguins right wing Patric Hornqvist. 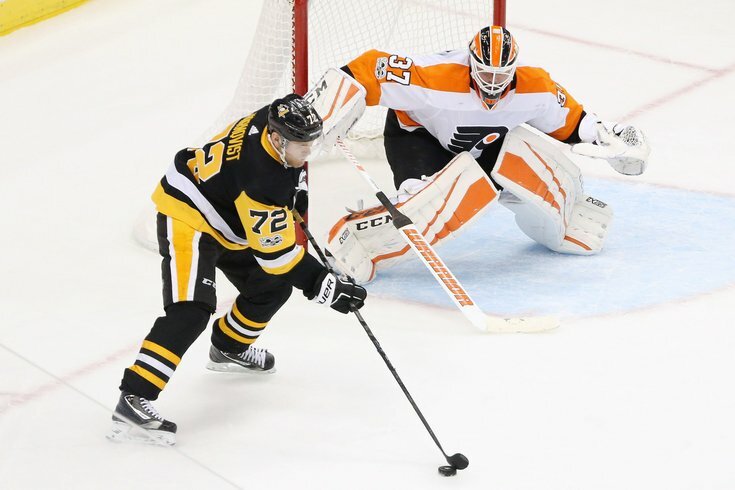 The key to the Flyers' chances against the Pittsburgh Penguins in the first-round of the Stanley Cup playoffs is a guy named Shayne Provosbehere – or is it Ivan Ghostorov? In other words, the combination of efforts from defensive partners Ivan Provorov and Shayne Gostisbehere will go a long way in determining if the Flyers can stop the Penguins in a series that starts Wednesday night in Pittsburgh. However – and let’s get this out of the way at the beginning – the Flyers have NO shot at winning their first-round playoff series against the Penguins if their goaltending is not way better than average. Their best (and probably only) chance at abruptly and unexpectedly ending the Penguins' quest for a Stanley Cup three-peat is if Brian Elliott regains the level of play he displayed before leaving the lineup due to a core muscle injury. In Elliot's two games since his return from surgery, the veteran goalie didn't look nearly as mobile as he had for most of the season – although some of that was to be anticipated. After missing nearly two months, it's only natural that Elliott would have to work off some rust and recalibrate his angles. There was certainly some risk that Elliott would struggle in those games, games the Flyers still needed to win in order to clinch a playoff berth. But coach Dave Hakstol took that risk by using him anyway, and even though their goalie wasn't at his best, the Flyers managed to get into the playoffs. More importantly, Elliott got some crucial playing time to steady his game – those two starts were as important to his mental edge as they were to his physical status. After the type of surgery Elliott required, any goalie would be worried about his ability to stretch and make a save, and every shot he faced in those games was a reminder that he's closer to 100 percent than he believes. But even with Elliott operating at maximum capacity, the Flyers will have their hands full with a Penguins team that won all four contests against them this season, scoring five goals in each game. The good news, however, is that two of those games were dragged into overtime – and the Flyers played their best in the two games in Pittsburgh, where this series will begin. Per usual, the Flyers will have to deal with a Pittsburgh offense that is a twin-turbo of power, led by Sidney Crosby and Evegeni Malkin. Those two are the only seasoned players (more than 60 playoff games) who have a better points-per-game average than Claude Giroux’s (0.98). Although it is convenient to look at match-ups in terms of lines – especially at center – there is also great value in examining the defensive pairings. And that is where the combo of Gostisbehere and Provorov will be so integral. The Penguins have a pack of forwards who love to pressure and pursue the puck in the offensive zone. The danger here is that, beyond Ghost and Provorov, the Flyers have second and third pairings that can be pressured. And the Penguins will bury a team that turns the puck over to its forwards. Although the Flyers coaching staff will want to spread out playing time, there is a good chance the top pair, especially Provorov, will need to play huge chunks of the game. In any case, the playing time will be a lot less stressful if the Flyers can stay out of the penalty box. The Penguins power play is cranking along at a franchise record of over 26 percent – and that’s saying a ton when you consider that players such as Mario Lemieux and Jaromir Jagr have been a big part of that history. The Flyers have been pretty good at staying out of the penalty box all season. But, just as Crosby and the Penguins bring out the emotions in Flyers fans, they also get under the skin of the players. In this series, Hakstol's team will have to be extremely disciplined, and they will have to avoid getting into the zoom-around game with the Penguins. The more they can keep the game at five-on-five – and the more they can control the puck, using a cycle game to slow down the Penguins – the better the Flyers' chances of getting out of this series alive. While it is expected that Giroux will continue his MVP-like performance in this series – just as it is expected that Sean Couturier and Jake Voracek will be huge contributors – a problem could arise if Pens center Derick Brassard is fully healed from the groin injury that kept him out of the lineup for the final five games of the regular season. Brassard was a key trade-deadline addition and got off to a slow start while getting adjusted to the Penguins' more open style. But if the former Ottawa Senator finds some chemistry with Conor Sheary and that third line, it could be a real headache for the Flyers. Hakstol will have to decide whether to continue to use Travis Konecny on the Flyers third line, or move Konecny back to the first line where he can produce some real magic with Giroux and Couturier. The guess here is that, by the end, Konecny is back with the two bigger guns, and the Flyers manage to keep pace with the Penguins for long stretches. But if Flyers fans really want to see Sidney Crosby dethroned the way the Eagles dethroned Tom Brady, they better hope Provorov, Gostisbehere and Elliott bring their A-plus games for the net two weeks. And maybe beyond.